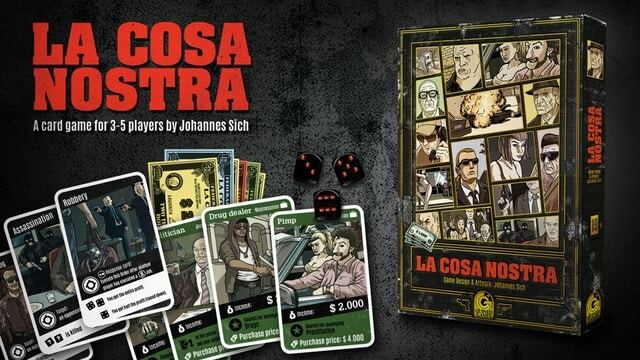 La Cosa Nostra is an negotiation game with a mobster theme (which means plenty of gladhanding and backstabbing), designed by Johannes Sich and published by Quined Games. Right from the start, I have to admire the honesty of the rulebook. On the first page, it tell you that “La Cosa Nostra is not a friendly game. You have to be mean and malicious in order to win.” We’re not talking cutesy mean, either, such as in a “take that”-style game like Smash Up. If you manage to pull off an attack or betrayal at just the right time, you might manage to inspire a true, flip the table-type moment that your group will never forget. Anyone who has toughed it out through a game or two of Diplomacy will know what I’m talking about. In other words, La Cosa Nostra isn’t going for a broad audience. 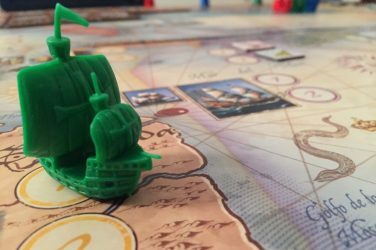 If you don’t like these type of aggressive negotiation games, you will definitely want to pass this one by. 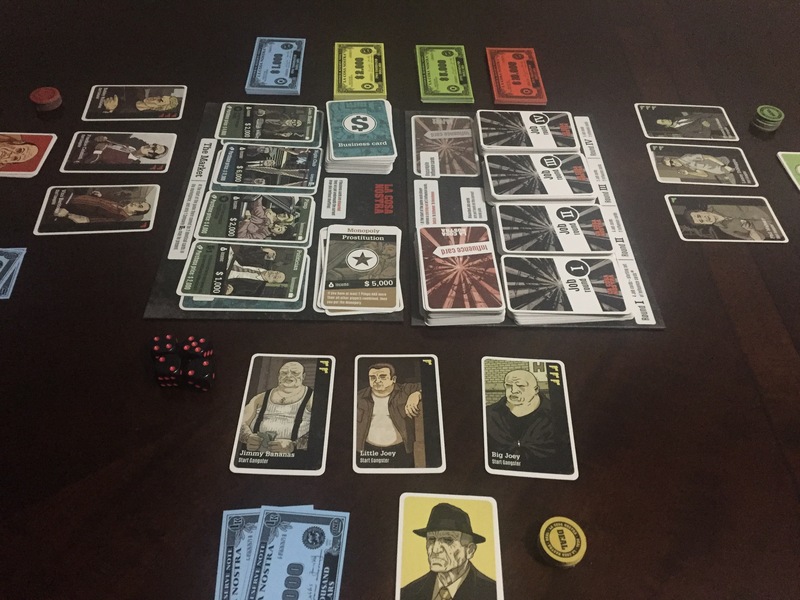 However, if you do like these type of games, or at least are open to the idea of playing one, La Cosa Nostra promises to deliver similar gameplay, but a much tighter time frame, while also using mostly cards instead of a big, sprawling board. At least, that’s the game’s intent. Let’s see if it follows through. 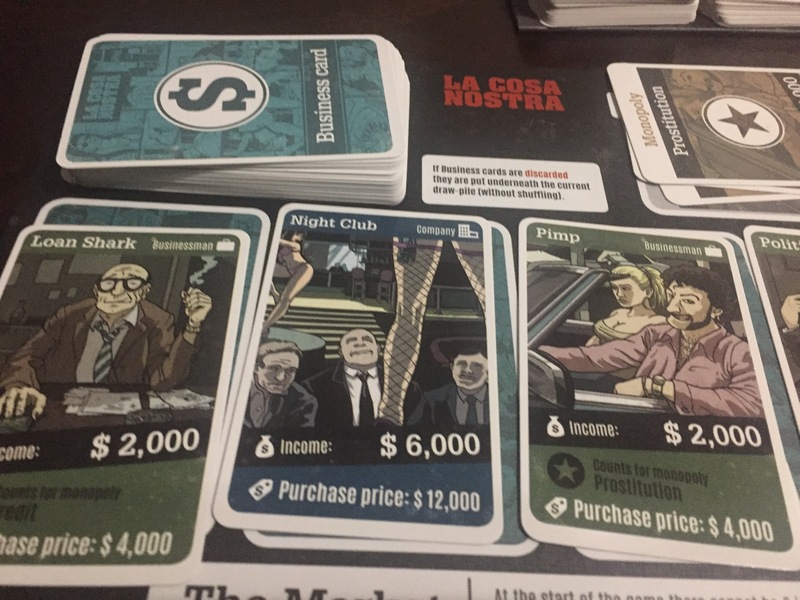 Every player starts with a Boss card (basically useless, except to indicate your player color), a little bit of money, three starting gangster cards, and three business cards. 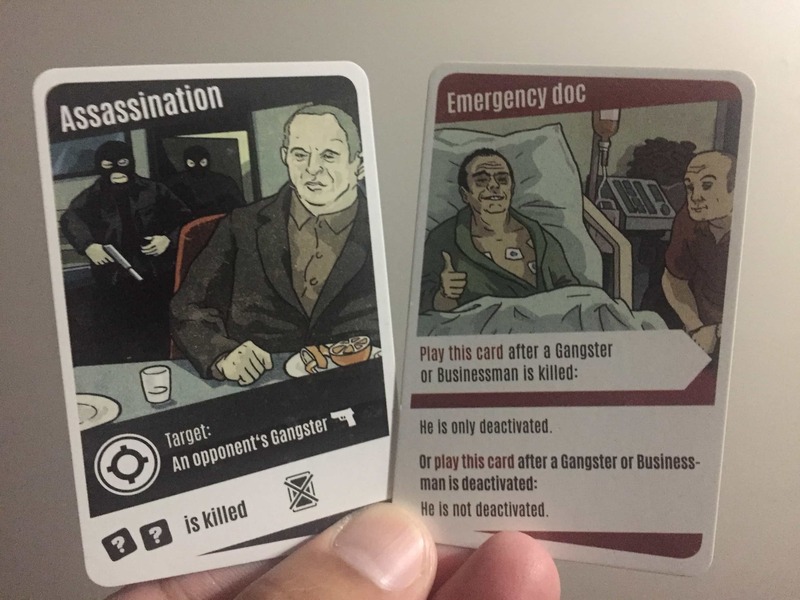 The gangster cards provide the foundation for the rest of the game play, since you need them to carry out any possible action. Because you start the game with three gangsters, you get three actions in the first round. As the game progresses, you will (and should) purchase more gangsters so that you can do more stuff. On the first part of your turn, you will set your actions by playing cards on top of your gangsters. For example, you might want to buy more business cards. They depict various criminals doing their thing, like drug dealers and pimps. Who doesn’t want to have more of those guys hanging around, right? 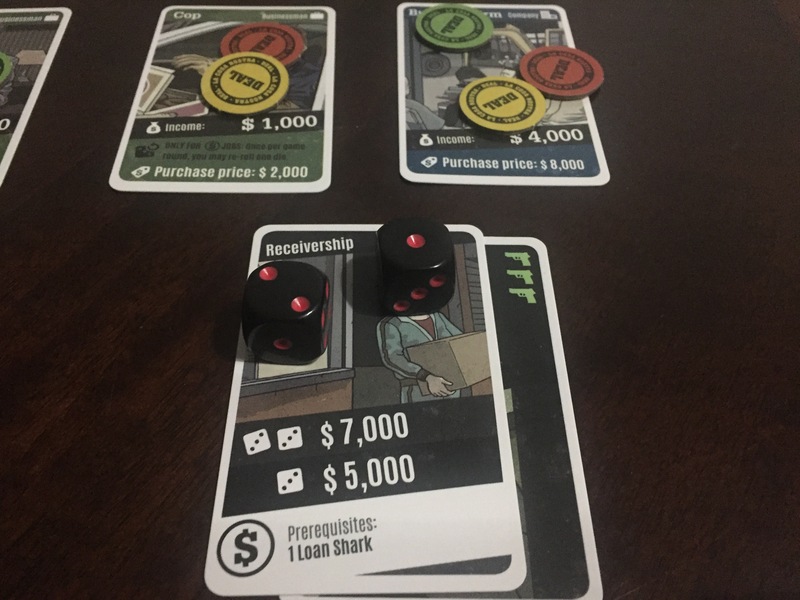 Along with increasing your end-of-round income, the business cards also act as prerequisites for job cards which you will also play via your gangsters. 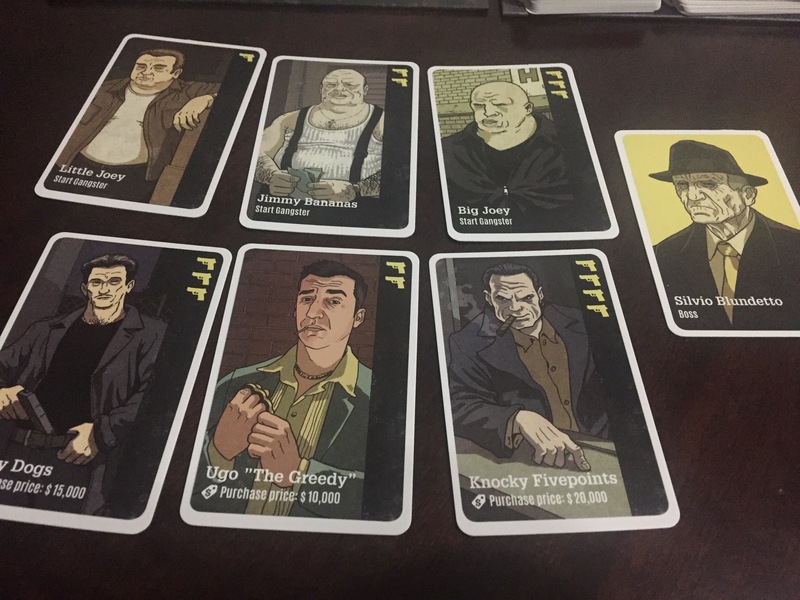 La Cosa Nostra packs a fair amount of theme into the interaction between the job and business cards. For example, in order to carry out the Investment Fraud Job card, you need both the Lawyer and Loan Shark business cards in play. If you happen to have the prerequisites in your tableau already, great! If not, then you have to make a deal with another player who has what you need. Here’s where the negotiation and the potential for backstabbing comes about. A player, for example, might want to carry out a Price Rigging job card, but you have the only Waste Company prerequisite business card on the board. You can then negotiate for pretty much anything – a cut of the payout, the promise not to be attacked in the future, etc. Be careful, though, because deals are non-binding! Your opponent has no obligation to follow through on any promised deal. If that wasn’t enough, you can also launch direct attacks against your opponents as job cards. You can steal money from them, or deactivate one of their cards, or even steal or kill one of their businessmen outright! Once you set everyone actions, then you resolve everyone’s cards in turn. For most of the job cards, you have to roll dice. The number of dice you roll depend on the number of guns on the gangster card. Usually, one success gets you something (cash, successful attack, etc. ), while two successes get you a better something. 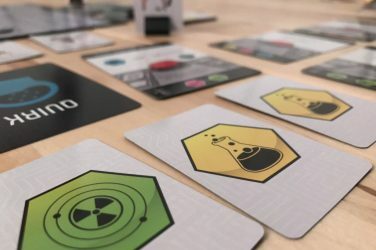 You can also use influence cards to somewhat nudge the dice one way or another. However, for the most part, you’re at the mercy of the dice. Hopefully your chosen gangster has lots of guns! Game play proceeds in this way for four rounds. In later rounds, you get beefier job cards (more lucrative to you/ devastating to other players), more influence cards, and more money to play with. However, basic game flow remains the same. At the end of the game, whoever has the most cash wins. If you tie, and you run through a few tiebreakers, then you have to arm wrestle to win. I’m not kidding, it says it right there in the rules. That’s… uhm… interesting. I mentioned before that La Cosa Nostra tries to pack in as much gameplay-driven interaction as possible in a relatively short timeframe – about 90 minutes or so. 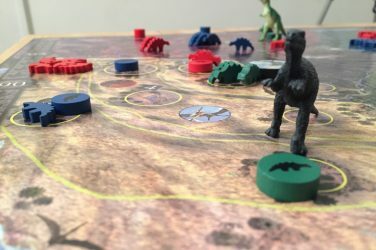 For fans of longer games like Diplomacy, Game of Thrones the Board Game, or the newer New Angeles, you may rejoice! I feel La Cosa Nostra delivers on that end. Of course, in a negotiation game, players can take as much time as they want. However, the object of negotiations tends to be fairly straightforward – are you going to let your opponent use your Politician card, or are you not? I found that having such a tight game space dedicated to negotiation keep the play time down a fair amount. This speaks to what I think is La Cosa Nostra’s greatest strength – there is a real, well designed game underneath all of the interaction. No one will ever confuse this with a tightly knit Euro game. 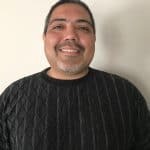 However, you can set up viable strategies to, for example, make your tableau appealing to other players and therefore more lucrative to you. Or, if you notice you have a hand full of certain kinds of jobs, you can try to buy the prerequisites when you see it so that you can accomplish as much as you can without having to deal with anyone. There’s lots of room to maneuver here, which I really enjoyed. Finally, on a personal level, I love highly portable games. Therefore, I love that La Cosa Nosta packs all of this gameplay in what are essentially multiple decks of cards with a few dice. You might not notice that until you start attending game nights at bars (the perfect setting for this game!). I think the pulpy, old comic strip art style will appeal to some folks. However, I found it to be kind of plain. Most of the drawings were fairly common stereotypes that didn’t really make any kind of impression on me. The only time I really noticed the art was when it presented something truly… adult, like the Senator’s Party Job IV card. Again, I can see some people really liking it. Not my cup of tea, though. 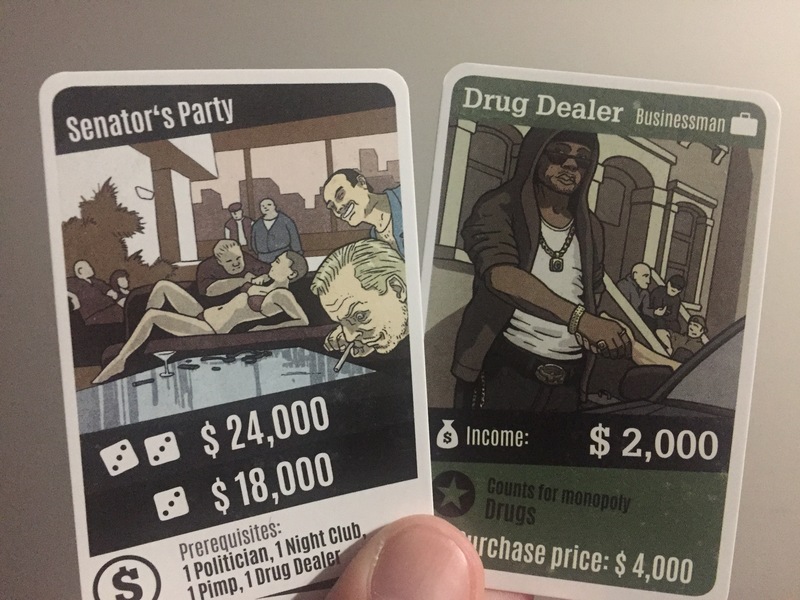 Since I’m talking about the card art, what’s up with the only black person in the whole game showing up on the drug dealer card? 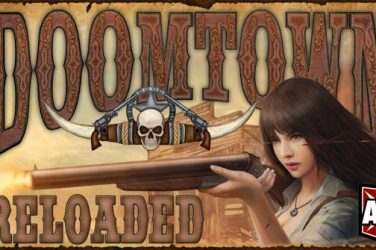 I think this game comes to us from a German publisher who might be getting their information from popular mob culture and literature. Still, why even open that door? If every single card had an Italian guy on it, I wouldn’t have noticed at all. In terms of gameplay, I feel that it’s open to some of the same flaws of other heavy negotiation games, while not doing much to address them. For example, a player can get completely hosed by a combination of bad dice rolling and an attack or two, right in round one. 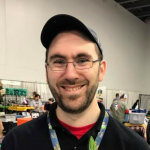 The rulebook advises that players can get back in the game by “skillfully exploiting the inattention of your fellow players.” What if they maintain their attention and don’t let you back in? One way to really put someone behind the 8-ball is to kill (or worse, steal) their best gangster. That is devastating and paralyzing! Some of the influence cards can mitigate this disaster. However, they don’t come as often as they need to. You’re a little bit at the mercy of deck RNG there. …Unless, of course, you’re so far behind that you play a kingmaker role. Again, I think every negotiation game is open to another player simply deciding to help another player win, simply because they’re already out of it. However, I don’t feel that La Cosa Nostra attempts to do much to dissuade such behavior. If we want designers of cooperative games to account for the alpha gamer, then a designer of a negotiation game should account for kingmakers, darn it! In reality, La Cosa Nostra works if you have a VERY select group at the table. They have to love these type of games, not take the backstabbing personally, and (formally or informally) agree to compete until the end, therefore avoiding behaviors like kingmaking. If you have that kind of group, then you might really enjoy this game. However, I had a really hard time getting players to try this out at my meetup of about 60 people. I was honest about how the game worked, and very few people were interested. A bit of real life bribery may or may not have been involved! Final Verdict/ Who is this game for? La Cosa Nostra knows what it is and who it is for – heavy negotiation gamers who take meanness in a game as a tactical challenge. 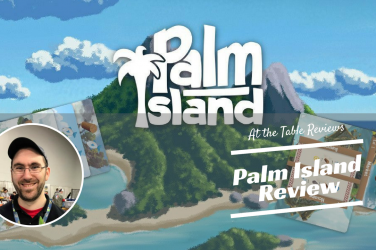 If you might be on the fence about a game like this, then player beware. Honestly, I was hoping for a game with a little bit of a wider appeal. However, if you like this kind of game, and especially if want to have that kind of experience in under two hours, then I can definitely recommend it for you. 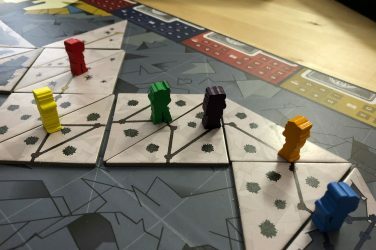 A heavy negotiation/ backstabbing game that plays in 90 minutes or less, with a very solid, well designed mechanical game system underneath.